MiMedx, a biotechnology research and development pioneer, recently upgraded the audio communications in their laboratory clean rooms, installing a powerful hands-free intercom system from Tech Works. 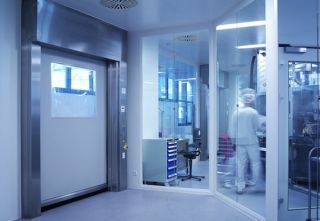 The facility's seven cleanrooms face many of the same challenges typical of sealed surgical settings, particularly in communicating between different sterile environments and the outside world. As Charlotte Anderson of Norcross, GA-based Audio-Tech Inc., explains, Tech Works CI-BUSS Collaborative Intercom provided a simple solution. "Tech Works was the only company we found that makes this kind of purpose-built system," Anderson said. "There are some contractors out there who kind of cobble together their own systems, grabbing all the different pieces and hoping it works. But Tech Works was able to provide us with a system that was simply the best solution for what the customer needed." The system includes the Tech Works CI-MSI-22 Microphone Speaker Interface, with all rooms connected via CAT 6 cabling. Each cleanroom is equipped with a wall-mounted microphone and ceiling mounted loudspeakers. Microphones are activated via a foot switch, enabling surgeons and medical personnel to keep their hands both free and sterile. And Tech Works' Automatic Level Control technology assures consistent, intelligible sound, from the lowest whisper to the loudest shout. "When they need to communicate with the other rooms, the foot switch activates their microphone, ducks the level of the speakers in that room, and broadcasts to the other areas," explained installer Ryan Stewart. "Anyone in any of the other rooms can just go to their microphone to respond. They love it and it works great."